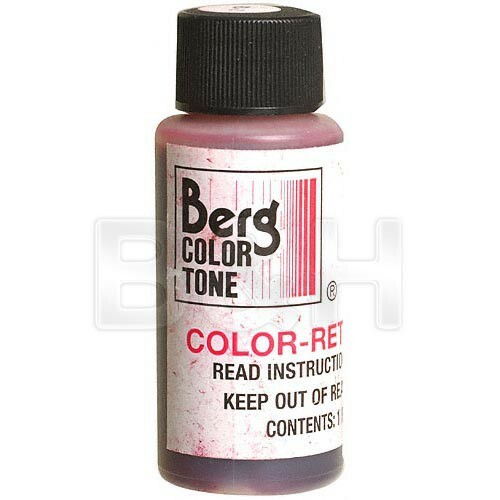 The 1 oz bottle of Berg Toner Refill for Black & White Prints converts B&W fiber- and resin-coated papers, as well as film and stabilization materials. The toners can be mixed to produce a wide range of colors that printers desire, which metal salt-type toners cannot make. This bottle produces a red-2 tone, and an activator (sold separately) is needed to allow the dyes to adhere to the photographic emulsion. Box Dimensions (LxWxH) 6.8 x 3.9 x 1.1"
Toner Refill for Black & White Prints (Red-2, 1 oz) is rated 4.5 out of 5 by 2. Rated 4 out of 5 by MinnieMouse from made experimenting easy and fun I used this toner on silver gelatin prints that were printed on fiber and glossy paper. It brought a brilliant red to all of the prints, but I got the most tones on the fiber paper. Great easy way to make old, boring photos new again. Rated 5 out of 5 by A. Charysse from Just what i needed was the right product, had a great price and it arived 2 days after i ordered it. What is the ratio of water to toner? that depends on the developer, usually it should come with a chart stating the ratios.